I’m a sucker for television shows that cross genres and formats. One of my most recent finds was the television show, Falling Skies, which also has a videogame and a graphic novel out at this time. 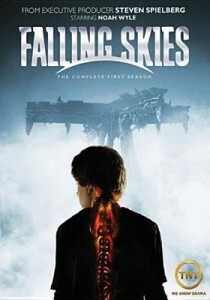 The library currently has multiple seasons of Falling Skies available for check-out. If you have never heard of this show, Falling Skies is a science fiction, post-apocalyptic drama that runs on TNT with its final season premiering on June 28th at 9pm. Falling Skies takes place after an alien attack has happened on planet Earth, forcing citizens to gather together and attempt to fight back. Boston professor of history, Tom Mason, played by Noah Wyle, is struggling to deal with the fact that his wife has died and his son has been captured by the aliens. Groups of people are being held captive, the number of dead is rising, and in order to rescue the captives, militia groups are forming to protect the survivors. What seems like a straight and easy plan becomes increasingly complicated as the survivors realize that the aliens are more intelligent and crafty than they initially believed. Mason and his group must band together and come up with new ideas to outsmart the aliens. 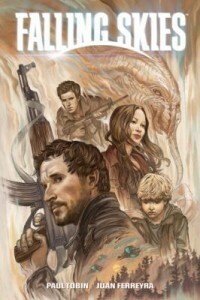 If the television show interests you, check out Paul Tobin’s graphic novel Falling Skies with artwork by Juan Ferreyra. Tobin’s graphic novel serves as a prequel to the television show. Here, you follow the life of Professor Tom Mason and his three sons who are forced to come to terms with the fact that Mason’s wife has died. Mason believes that in order to survive, they must all hide, which ultimately backfires when one of his sons is captured by the aliens. The artwork in this novel draws from the likeness of the television characters with viewers of the show easily able to recognize their favorite characters. Tobin draws a tale for readers about the months after the alien attack and Mason’s decision to join a militia group to rescue his son. 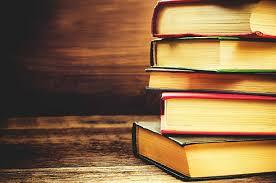 Fans of the television show will not be disappointed in the graphic novel. 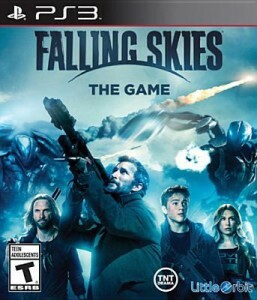 The final part of Falling Skies’ transition across genres in the videogame available on PlayStation 3 called Falling Skies: The Game. This game expands upon the tactical warfare element of the television show and by extension, Tom Mason’s vast knowledge of historical warfare and battle strategy. In the videogame, players have the option to customize and maneuver their squad in order to outsmart the enemy. In addition to the over 90 tactical warfare missions, players are also given the option to undertake an infinite number of side quests. This turn-based style of gameplay allows you to complete missions and finish objectives as you command a squad made up of anywhere from 1-6 units. Check out any of the Falling Skies materials available at the library and let us know if there are other materials for which you are looking!